E-learning is evolving from a simple web-based tool into a complex managed environment. Built into new e-learning systems is the ability to monitor a learner's course selections and progress. In an era where organizations seek to tempt innovation from knowledge, the impact of tightly supervised e-learning environments becomes a key consideration. Drawing from ideas stemming from agent and social exchange theories, this paper demonstrates that under conditions where organizational relationships exist involving trust and loyalty, monitoring can have a detrimental effect on the utilization of e-learning environments. Conversely, monitoring may proclaim a positive impact on e-learning usage in circumstances where jobs are simple or mundane, and an abstract relationship defines that between the supervisor and supervisee. Wesley, D. (2002). A Critical Analysis on the Evolution of E-Learning. International Journal on E-Learning, 1 (4), 41-48. Norfolk, VA: Association for the Advancement of Computing in Education (AACE). Retrieved April 26, 2019 from https://www.learntechlib.org/primary/p/9168/. Adkins, S. (2001). 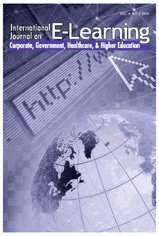 Market analysis of the 2002 U.S.E-learning industry. Sunnyvale, Brandon-Hall.com. Akerlof, G., & Yellen, J. (1986). Efficiency wage models of the labor market. Cambridge: Cambridge University Press. Aldrich, C. (2001). Can LMSs survive the sophisticated buyer? LearningCircuits.org. Baker, G.P., Jensen, M.C., Murphy. K. (1988). Compensation and incentives: Practice vs. Theory. Journal of Finance, 43, 593-616. Barkema, H. (1995). Do top managers work harder when they are monitored? Kyklos, 48, 19-42. Blau, P.M. (1964). Exchange and power in social life. New York:Wiley. Blunt, R. (2001). How to build an e-learning community: Foster peer-to-peer learning networks. Elearningmag.com. Ciborra, C.U., (Ed.) (1996). Groupware and teamwork: Invisible aid or technical hindrance. Chichester: John Wiley and Sons. Coase, R. (1937). The Nature of the Firm. Economica, 4, 386-405. Deci, E., & Ryan, R. (1980). The empirical exploration of intrinsic motivational processes. Advances in Experimental Social Psychology, 10(1), 39-80. Dreyfus, H.L. (2001). On the internet. New York: Routledge. Frey, B. (1993, October). Does monitoring increase work effort? The rivalry with trust and loyalty. Economic Inquiry, XXXI, 663-670. Galliers, R.D., & Newell, S. (2000). Back to the future: From knowledge management to data management. LSE Working Paper Series, 92. Gilson, S.C. (1989). Management turnover and financial distress. Journal of Financial Economics, 25, 241-262. Glass, N. (1998). Management Masterclass: A practical guide to the new realities of business. Sonoma, CA: Nicholas Brealey. McGraw, K. (1978). The detrimental effects of reward on performance: A literature review and a prediction model. In M.R. Lepper & D. Greene (Eds.) The hidden costs of reward: New perspectives of human behavior, (pp. 33-60). New York: Lawrence Erlbaum. Paulsson, K., & Sundin, L. (2000). Learning at work: A combination of experience-based learning and theoretical education. Behaviour and Information Technology, 19, 183-190. Peters, T. (1992). Liberation Management. New York: Pan Books. Shani, A.B., Sena, J.A., Stebbins, M. (2000). Knowledge work teams and groupware technology: learning from Seagate's experience. Journal of Knowledge Management, 4(2), 111-124. Simon, H. (1976). Administrative behavior. New York: Macmillan. Granovetter, M. (1985, December). Economic action and social structure: The problem of imbeddedness. American Journal of Sociology, 91(3), 481-510. Simon, H. (1991). Organizations and markets. Journal of Economic Perspectives, 5(2), 25-44. Grudin, J. (1988). Perils and pitfalls: Groupware in depth. BYTE, 261-264. Gurteen, D. (1998). Knowledge, creativity and innovation. Journal of Knowledge Management, 2(1), 5-13. Statt, D. (2000). Using psychology in management training: The psychological foundations of management skills. London: Routledge. Homan, G.C. (1961). Social behaviour: Its elementary forms. New York: Harcourt, Brace, Jovanovich. Kay, N.M. (1979). The innovating firm. London: MacMillan. Kohn, A. (1993). Punished by rewards: The trouble with gold stars, incentive plans, A's, praise, and other bribes. Boston: Houghton Mifflin. Lee, F., Has, H. (1996). A quantitative assessment of high knowledge industries versus low knowledge industries. In P. Howitt (Ed.) The implications of knowledge-based growth for microeconomic policies. Calgary: University of Calgary Press. Lefebvre, L.A., Lefebvre, E., Mohnen, P. (Eds.) (2001). Doing Business in the Knowledge-Based Economy: Facts and Policy Challenges. Boston: Kluwer. Stebbins, W.M, & Shani, A.B. (1995). Organization design and the knowledge worker. Leadership and Organization Development Journal, 16(1), 23-30. Taylor, G. (1998). Knowledge companies. In W.Halal (Ed.) The infinite resource: Creating and leading the knowledge enterprise. San Francisco: Jossey Bass. Warner, J.B., Watts, R.L., Wruck, K.H. (1988). Stock prices and top management changes. Journal of Financial Economics, 20, 461-492. Williamson, O.E. (1975). Markets and hierarchies: Analysis and antitrust implications. New York: The Free Press. McAdam, R., & McCreedy, S. (2000). "A critique of knowledge management: Using a social constructionist model. New Technology, Work and Employment, 15(2), 155-168. Is E-learning Born for Formal Learning?